By default, when you enter a keyword in the search box of the Start menu, Windows 10 will also search the web via Bing. In my view, it makes a lot of sense to disable this feature on all the computers in your network via Group Policy. If I remember it right, Google brought up this weird idea of integrating desktop search with web search. When Google introduced a sidebar for Windows XP that allowed you to search in files on your desktop and the web, many bloggers around the planet interpreted this as a declaration of war against Microsoft. Steve Ballmer agreed with the bloggers and the software maker introduced Desktop Search, which was later renamed to Windows Search. According to me, it doesn’t make any sense from the user’s point of view to integrate desktop search and web search. It is like if a search of the local library catalog includes the products from the grocery next door—you know, just in case you are searching for a cookbook and want to shop for the ingredients for your next recipe after your library visit. Integrating web search in the Windows 10 Start menu might make sense from Microsoft’s point of view because it helps the software giant push Bing. 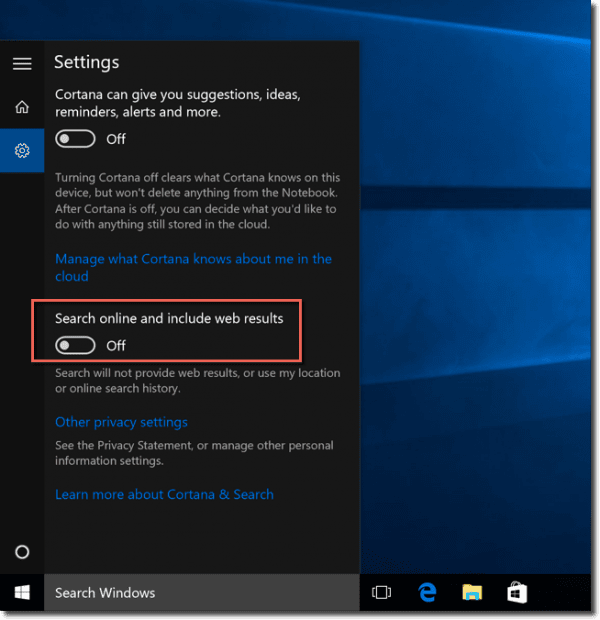 However, I doubt that this feature really improves the Windows 10 user experience because it devalues Search. If I want to find an item on my computer, I don’t need to search it on all the web servers on the planet. The effect is that the search results are cluttered with irrelevant links that only help lose focus and waste space on the tiny Start menu. I think that, instead of pushing Bing, Microsoft should ensure that local search works properly, which it often does not. 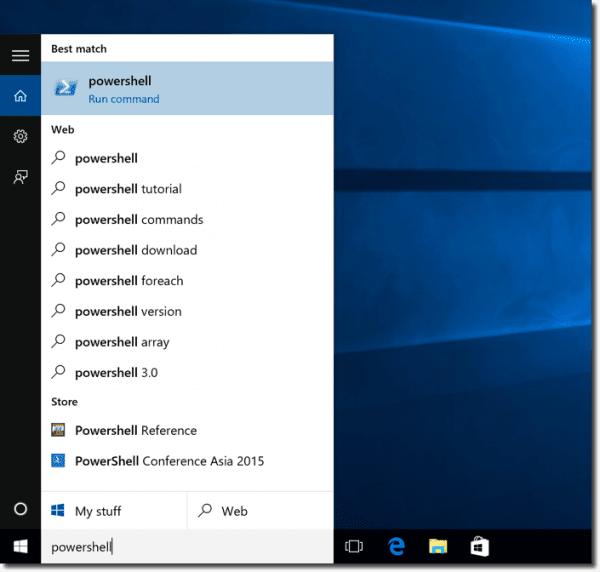 For instance, if you want to launch PowerShell ISE and you type “powershell” in Search, on a freshly-insatlled Windows 10 computer, you won’t find Microsoft’s scripting tool. Instead, it displays a lot of irrelevant web links. You have to type “powershell ise” to find PowerShell ISE. If I really want to search for a PowerShell tutorial on the web, I use my web browser and the search engine of my choice. You also have to take into account privacy. If users search for confidential information on the desktop, say a password stored in a local file, you don’t want this keyword to be sent across the web. 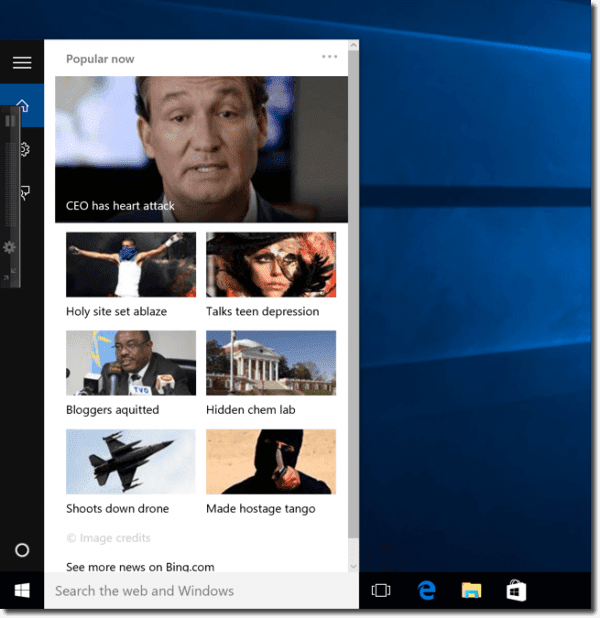 Another reason you might want to disable web search in Start is the News links that Windows 10 displays when you click the search box. Why would any employer want to encourage users to read the news during work time? Start loads news from the web. Thus, I recommend disabling web search in the Windows 10 Start menu. If you just want to get rid of web search on your own computer, you just have to click the search box and then click the settings symbol on the left. I think that, instead of pushing Bing, Microsoft should ensure that local search works properly (which it often does not). For instance, if you want to launch PowerShell ISE on a freshly installed Windows 10 and you type “powershell” in Search, Windows 10 won’t find Microsoft’s scripting tool; instead, it displays a lot of irrelevant web links. You have to type “powershell ise” to find PowerShell ISE. If I really want to search for a PowerShell tutorial on the web, I use my web browser and the search engine of my choice. PowerShell ISE can be hard to find with Start Search. Another thing to take into account is privacy. If users search for confidential information on the desktop, say a password stored in a local file, you don’t want this keyword to be sent across the web. Thus, I recommend disabling web search in the Windows 10 Start menu. If you just want to get rid of web search on your own computer, you merely have to click the search box and then click the settings symbol on the left. You can then configure Search to not search online or include web results. If you want to disable web search results in Start on all your computers in the network, you can enable the Group Policy Don’t search the web or display web results in Search, which you can find in Computer Configuration > Policies > Administrative Templates > Windows Components. After I ran gpupdate, I had to sign out and sign in again for the policy to take effect. Note that this policy also disables Cortana. Microsoft’s personal assistant needs access to Bing and therefore can’t work if you disable web search. I’d say this is a welcome side effect of this policy because this AI toy is another Windows 10 feature that only distracts users from their work. 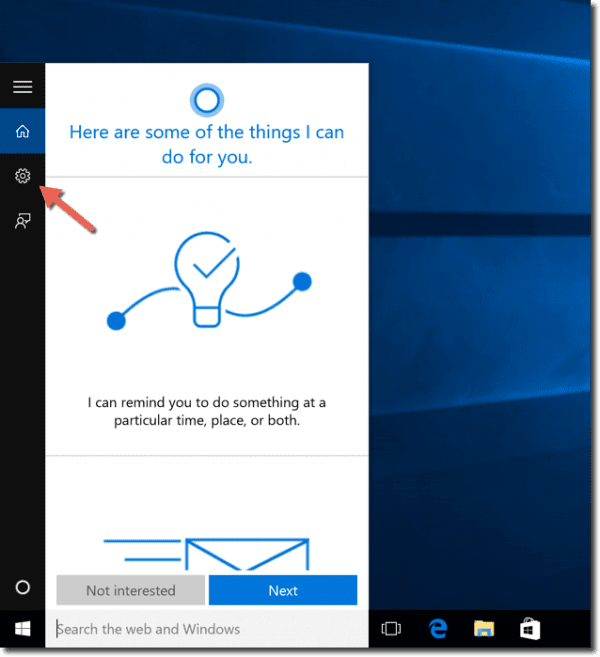 If users then open the search settings, they will be informed that Cortana and Online Search have been disabled by company policy. 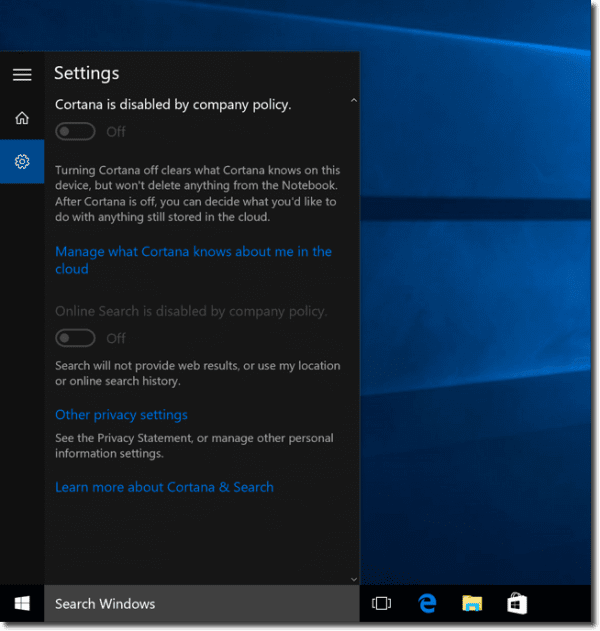 Search and Cortana are disabled by company policy. A second policy exists that allows you to disable this feature only for metered connections. Microsoft likely added this policy because Start downloads pictures from news sites when you click the search box. 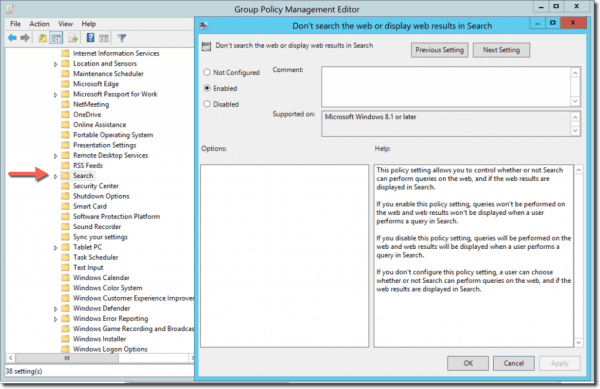 By the way, don’t confuse this Windows 10 policy with the Do not allow web search policy. As far as I could see, this policy has no effect on Windows 10. It only affects older Windows versions that run the old Desktop search. What is your view about the web search integration in Start?